I promise, I had nothing to do with this! 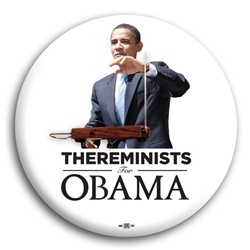 Democraticstuff.com is offering a "Thereminists for Obama" button for a mere $1. Sure, Bill Clinton could play the saxophone, but that's nothing compared to a theremin-playing President! If you think Barack Obama's theremin persona works, check out his Rick Astley cover. If he doesn't get elected President of the United States, maybe he'll agree to be our spokesperson for World Theremization? We can only dream... yes we can.